To balance out your latest five-course dinner, you occasionally require a five-and-a-half-dollar lunch. A delicious, delicious five-and-a-half-dollar lunch. Find it at Spoc's, an unassuming sausage stand open now. Deep in the heart of Westwood, where lunching businessmen casually loosen up their ties as UCLA coeds bounce by, this place isn't much to look at—but don't let that fool you. If the wildly popular In-N-Out next-door is the all-star quarterback, this place is the art nerd hidden behind bad clothes, but with really good ideas. Like a Smoked Portuguese Linguica Sausage (it's pork), topped with grilled peppers and onions. Or a Poultry, Chile & Cilantro sausage. 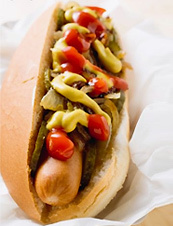 Maybe a Chicken & Mango dog or a Honey-Smoked Brat. 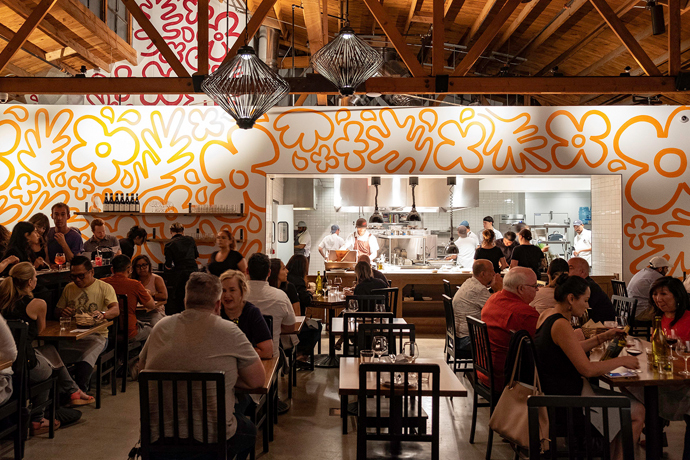 The owner is behind the Cabbage Patch in Beverly Hills, and once upon a time was Rustic Canyon's first chef—but lately he'd been dreaming of elevating the greasy lunch. He gets the meat from a family-owned SoCal operation called Papa Cantella's—it's smoked and then grilled, before getting dropped into a soft La Brea Bakery bun. Get your order with a soda and some fries, house-seasoned with smoked paprika and cayenne pepper, and it'll set you back a whole $5.50. Which leaves $14.50 for mustard.